Welcome to our hub for all things seed-related! Here you will find our seed catalogue with all the seeds we currently have in stock along with some growing information, seed saving resources we recommend, and general information to help you start growing your own food! What is a seed library? And why do we have one at Santropol Roulant? There are actually different kinds of seed libraries. The Svalbard Global Seed Vault, located on a small archipelago off the coast of Norway, houses the world’s largest collection of seeds at the moment. It was built for the purpose of conserving world crop biodiversity in an apocalyptic scenario. We hope it won’t come to that, which is why we’re taking our own steps to conserve local crop biodiversity by encouraging smaller-scale seed saving. That brings us to why we built a seed library here at Santropol Roulant, a community-oriented organization involved in urban agriculture and focused on food security. The two pillars that our local seed library project is built on are increased physical and financial access to the means of food production, and knowledge-sharing. By making the seeds in the library free without a membership requirement, we hope to empower more people to grow their own food. Our goal is also educational, and we hope that by engaging in and experimenting with urban agriculture people will feel less alienated from the food production process. This is why we’re being explicitly political about our gardening. We understand and recognize that the land we cultivate is not our own and that it’s original stewards are indigenous groups such as the Mohawk people of the Haudenosaunee Confederacy. We also realize that recognizing this fact is not enough, and that we must build links and solidarity with the Indigenous peoples of this land in order to repatriate it back to them. We also stand against the principles of industrial agriculture that deplete the soil, destroy crop diversity, and endanger people’s health. Our focus on local and smaller-scale urban agriculture is a product of that. In order to help you get started on your own local gardening project, however big or small, we’ve gathered some resources on this page. We hope to update it and swap out links as they become more or less relevant, and we appreciate your feedback! Here is a Google Sheets of all of the seeds we currently have in stock. The ones that are highlighted are still viable, and easily available to borrow. The highlighted row colors correspond to different years, check the legend. Plant varieties are also organized by plant family. 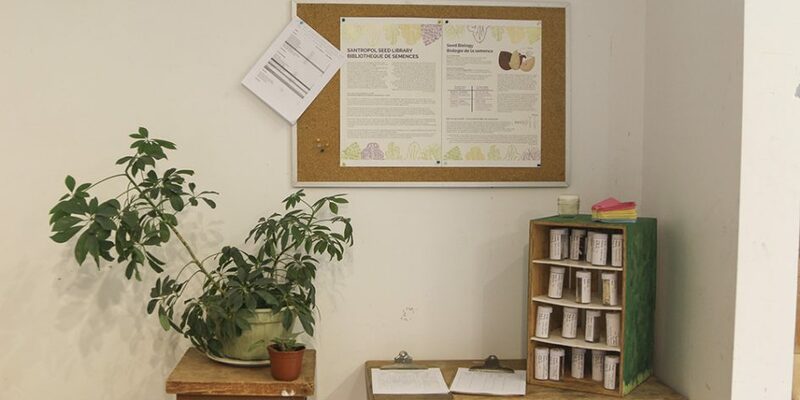 Our physical seed library is located at 111 Rue Roy Est, next to our general store. We’ve designed an info poster as well as a small pamphlet to accompany it, both of which we will share here. We will also attach our seed catalogue so that you can look at all the varieties we have along with their specific information (we’ve marked the ones that are still viable by highlighting them. In general seeds have an average shelf life of about 5 years without particular storage conditions). How do I take seeds out of the library? 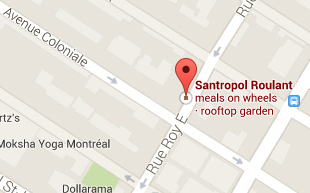 Come to Santropol Roulant (111 Rue Roy Est) and ask someone about where the seed library is. We’ll have about 15-20 seed varieties on display at a time, with the rest of the varieties being stored in the basement. If the variety that you’re looking for isn’t on display, we might still have it! You can return your seeds by filling out the Seed Return Record in person and giving us the relevant information. The Urban Agriculture team will place them in the appropriate containers. How do I grow out my plants? The resources provided on this page should help you grow out your plants! If they do not cover the specific information you require you can look up the variety you’re growing by Googling it to find growing information from different seed providers. You could also attend the Urban Agriculture program’s series on how to grow your plant babies, given throughout the year. To be kept up to date on all upcoming events you can check our newsletter or go to the Urban Agriculture page on our website! What if I want more information? Can I stop by and ask anyone? Of course! For more information, you can visit us in person and talk to the Urban Agriculture manager or one of our UA interns. Where are your seeds from? Our seeds come from a variety of providers that are all organic, to see which provider a specific variety came from please refer to our seed catalogue higher up on this page. What happens if I don’t bring the seeds back? Nothing! We won’t chase you down or question you, we believe in making this library as accessible as possible. If it happens that you couldn’t grow out for seeds for any reason that’s completely okay, we’re proud of you for trying! As well, you’re not obligated to leave any contact information on the Borrowing or Return records for this reason. Absolutely! That’s more than encouraged! Come by in person to donate your seeds, the process is similar to returning seeds.